Every state in the Union has a “state flower.” Louisiana has two, a state flower and a state wildflower, but Texas has five. Why is that? 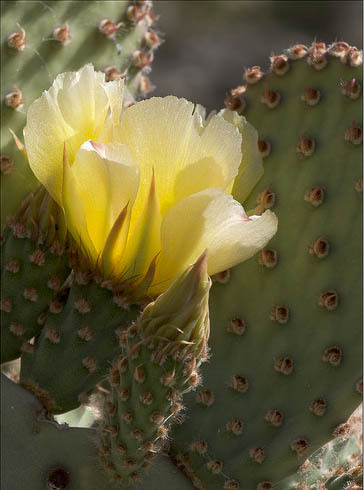 Opuntia Rufida ~ The "Blind Eye Prickly Pear"
In 1901 the Texas Legislature determined to choose a state flower. During the debates many were considered, but in the end it all boiled down to three finalists – cotton bolls, prickly pears, and bluebonnets. The National Society of Colonial Dames of America in Texas fiercely championed the Sandyland Bluebonnet. The Sandyland Bluebonnet is a dainty little plant found on the sandy rolling hills of coastal and southern Texas. Growing from 6 to 12 inches tall, it has a light blue flower with a white center which turns purple as the flower matures. While the Sandyland Bluebonnet puts on a fine show in early spring, it was never the most popular Bluebonnet in the state. Most Texans preferred the showier Texas Bluebonnet, and for the next 70 years they urged the Legislature to correct its errant ways. Wary of offending Sandyland defenders, the Legislature finally changed the state flower to include the Texas Bluebonnet, and “any other variety of bluebonnet not heretofore recorded.” Thus Texas came to have five state flowers, all of them bluebonnets. The Texas Bluebonnet is widely known as the state flower of Texas. It grows mostly in the Blackland Prairie and the Edwards Plateau, and its distribution is somewhat wider than the Sandyland species. The Texas Bluebonnet’s flower stalks are taller than the Sandyland species and the blossoms are more abundant. Even in winter it is an attractive plant, growing in a dark green rosette with pointed leaves and a light covering of white hairs. The hairs tend to gather moisture, so the plant becomes beautifully “frosted” during wet winter freezes. 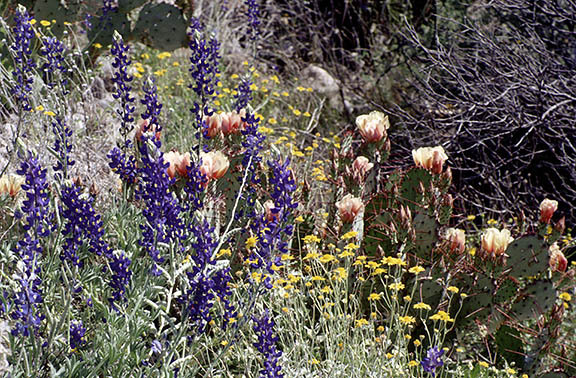 Four of the state’s bluebonnets, the Dune Bluebonnet, the Sundial Bluebonnet, the Bajada Bluebonnet, and the Chisos Bluebonnet are rarely seen by most Texans because of their limited distribution. The Dune Bluebonnet, reaches the southernmost edge of its range in Hartley county – the only place it grows in Texas. A perennial, it grows up to 2 feet tall and blooms in late spring. The leaves are broader and paler than our other bluebonnets and the flowers lighter. The Sundial Bluebonnet, reaches its southwestern limits in the extreme southeast part of Texas growing only in Jefferson and Hardin counties. It, too, is a perennial. 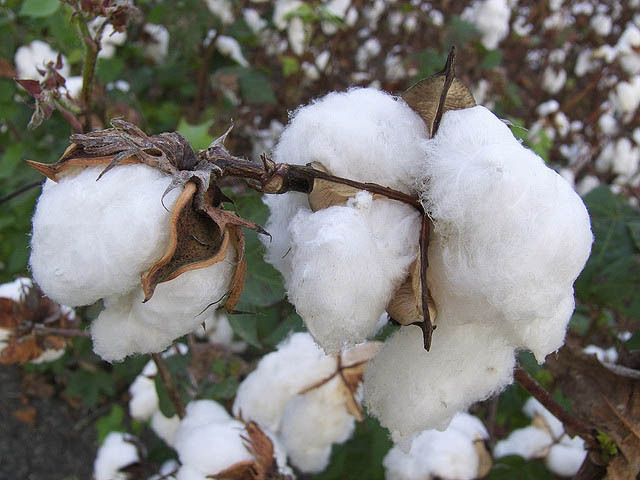 This plant prefers well-drained, sandy soils with a slightly acidic pH. It grows as far north as Wisconsin. 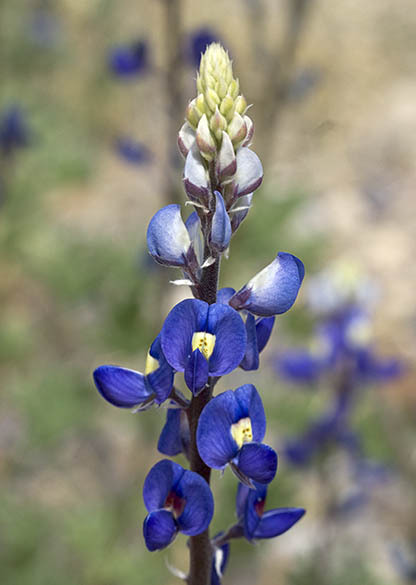 In Jeff Davis and Presidio counties we sometimes see the Lupinus concinnus, or the Bajada Bluebonnet. It is a small and inconspicuous bluebonnet growing only 2 to 7 inches high. This lovely little plant is native to California and blooms in early spring here. The flower stalks are short and the blossoms are not very dense. They have more red in them than other lupines, however, a characteristic which has earned them another popular name – the Scarlet Lupine. Big Bend Bluebonnets are Big! Here in the Chihuahuan Desert we have the largest bluebonnet of them all, the Chisos Bluebonnet. This stately bluebonnet grows in northern Mexico and reaches the northern limit of its range in Presidio and Brewster counties. Considering the population of these counties, it would be fair to say that the Chisos Bluebonnet is another flower that is seldom seen; nevertheless it is fiercely loved by West Texans. This plant is one of the earliest bloomers in our area, and although the flower stalks are not as densely covered with flowers as other species, they stand up to 4 feet high and have a sweet perfume you can smell for miles. Bluebonnets are not hard to grow, but may be difficult to get started. Just remember that they insist on well drained soils and lots of sunshine. Also, they must be planted in early fall, and the seeds must be covered with soil in order to germinate. Broadcasting is a great way to feed the birds, but it’s not a good way to get bluebonnets. Starting with commercially produced seeds is the best way to get started – less than 20% of wild seeds will germinate in any given year. You can improve that rate by scarifying the seeds. Whether you grow them in your yard, or drive south to enjoy the Chisos bluebonnets, bluebonnets are an important part of our Texas heritage and a fine way to welcome the Texas spring. Great article on desert plant adaptations. I saw the notice you posted in the TMN Yahoo digest. Nice article on the history of the Texas state flowers. It’s ironic to think of this from a different perspective as one from the Pacific Northwest: Lupines (Lupinus spp.) are considered noxious weeds in the PNW. The plants sequester selenium from the soil in very high amounts and most of the spp. are poisonous to livestock, especially sheep and cattle. Thus, we livestock owners usually eradicated lupines (your Texas Bluebonnets) from our fields. 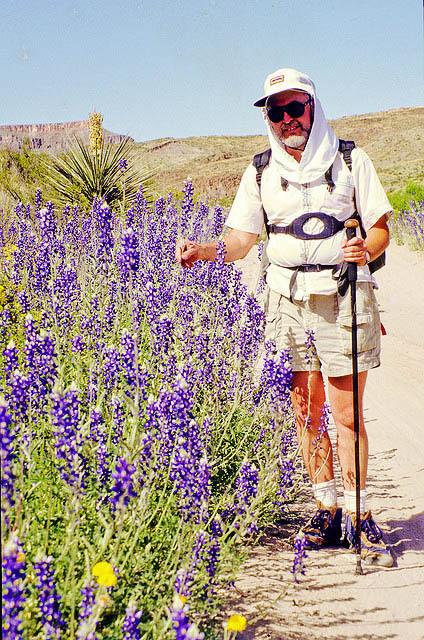 I remember the Chisos Bluebonnet fondly from my late March 1998 trip to the Big Bend – very pretty. Wish I could try some with my designs in Abq and esp El Paso. I wonder if the seed is available? I truly believe they would do fine in either locale. I’ve never seen the seeds for sale, but I could probably harvest a handfull of them for you at the end of the summer. 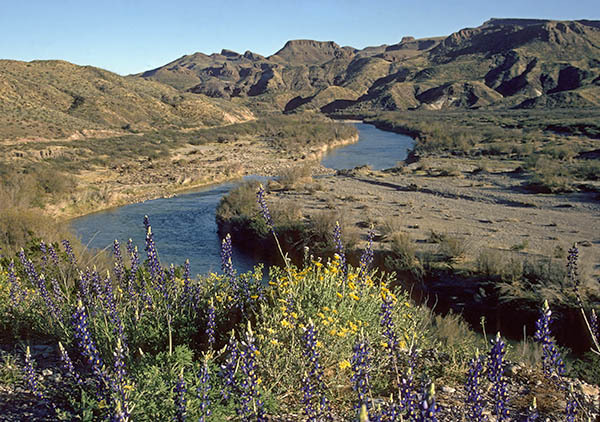 I found a wallpaper of Big Bend with the Chisos Bluebonnet in it and have been searching for seeds. Any suggestions of where I can buy them?